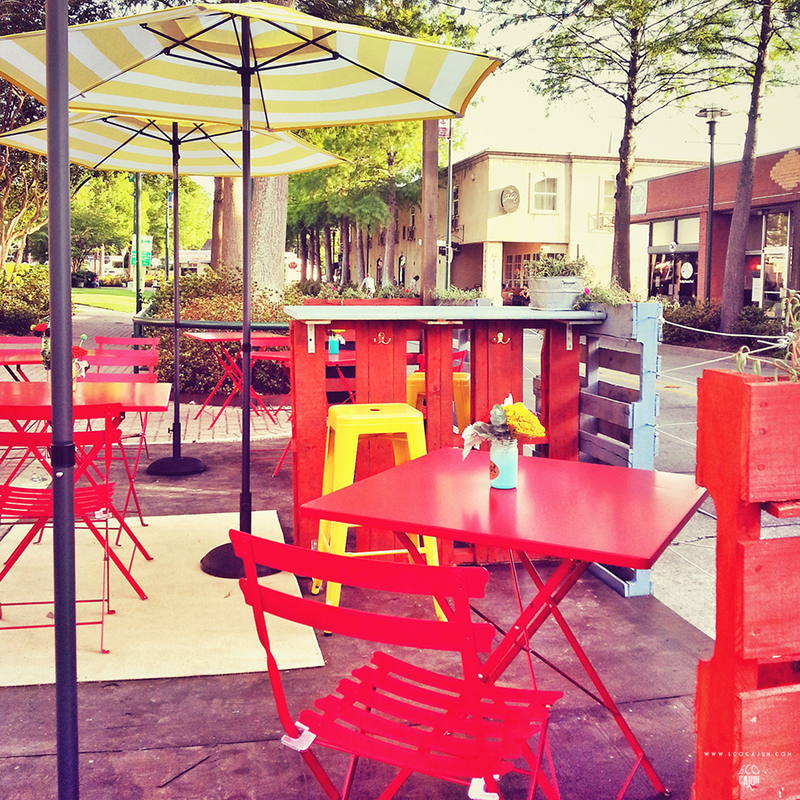 A few weeks back, I wrote about the upcoming PARK(ing) Day events in Lafayette. PARK(ing) day is an annual open-source global event where citizens, artists and activists collaborate to temporarily transform metered parking spaces into public “PARK(ing)” spaces. A handful of Downtown Lafayette metered parking spaces will be transformed into interesting, vibrant public spaces. But what exactly are parklets and what is their goal? 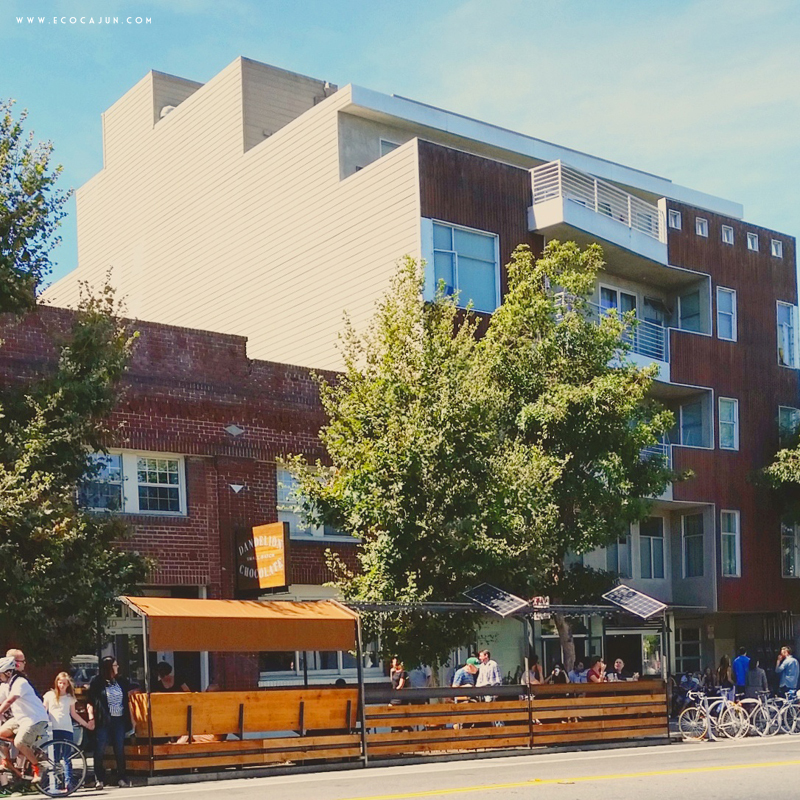 Parklets are meant to encourage community, alternative transportation, and walkability of city spaces, along with supporting nearby local businesses. They're a way to re-envision streets as being for cars only. Pavement to Parks is a San Francisco initiative that "seeks to test the possibilities of these underused areas of land by quickly and inexpensively converting them into new pedestrian spaces." Read their program goals. 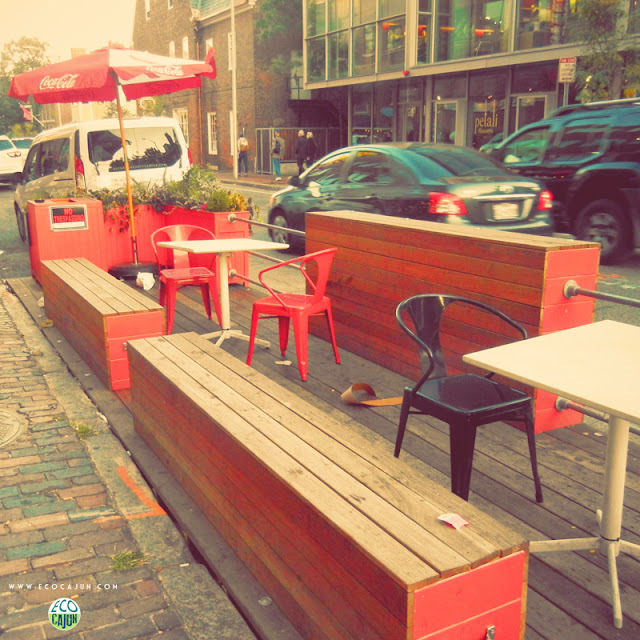 Many parklets create outdoor seating options, allowing people to visit and enjoy the surroundings. Some serve as public art galleries (check out the parklet projects in San Francisco). Some function as bicycle parking. The San Francisco Great Streets Project defines a parklet as "a small public sidewalk extension, usually extending two parking space lengths, that uses non‐permanent materials (e.g., it is not concrete). It combines elements such as seating, trees, flowers, shrubs, umbrellas, bike parking or lighting that reflect the unique character and needs of the location." Lafayette's first two parklets came with some education on why these mini-spaces make a big impact. 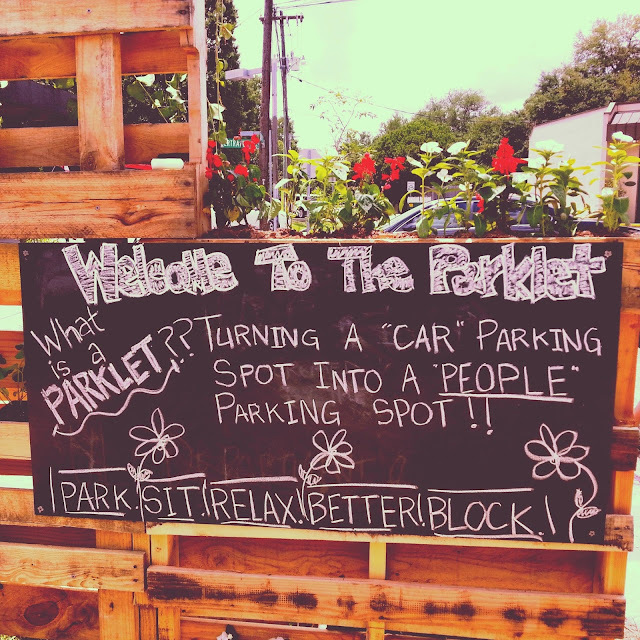 At Better Block Bertrand in May 2014, the message was simple. Instead of using an on-street parking space for a car, the space was dedicated for people to use. The parklet featured a bench made with repurposed pallets, and had some small fresh plants to bring color to the space. While the Better Block Bertrand parklet was temporary, Lafayette's very first parklet is still going strong after more than three years. Parklets are usually the result of a partnership between the city and local businesses, residents or neighborhood associations. According to the National Association of City Transportation officials: "While parklets are foremost intended as assets for the community, their presence has also been shown to increase foot traffic, and in some cases revenues, for adjacent businesses." Visit Downtown Lafayette this Friday, September 15, and see how on-street parking spaces have been transformed into parklets! 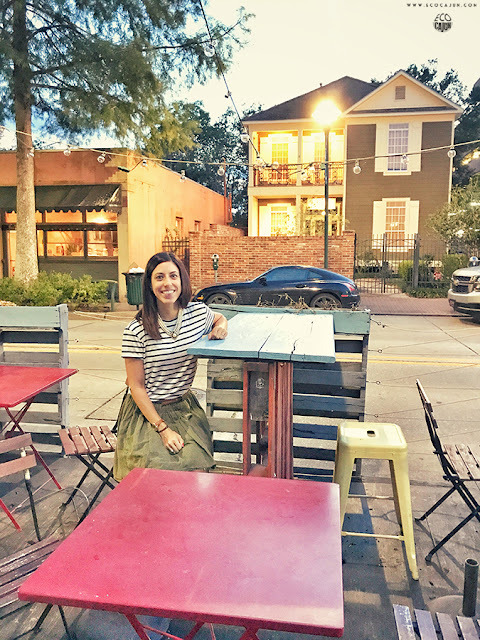 I'm very interested to see how different members of the community envision repurposing a parking space, and see how all of the parklets combined transform the scenery of Jefferson Street! 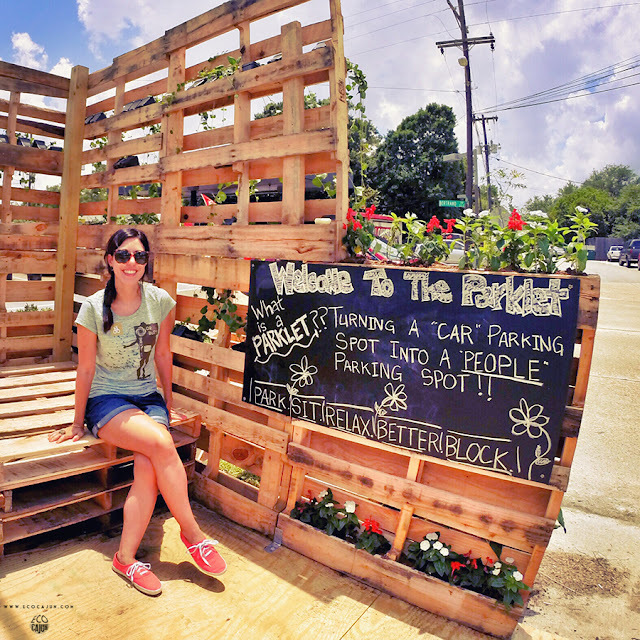 View the ReCover Acadiana Facebook event for PARK(ing) Day.